When it comes to keeping your windows clean, there are more obstacles in your way than you might think. You have to go up against time constraints, heights, static and stubborn stains. Instead of going into battle against all of these elements, have our Gorillas do it for you. Our Vaughan window cleaning is available for residential, commercial and multi-unit properties. The trouble with windows is that they are always collecting new surface dirt. You might spend an entire day cleaning windows only to turn around and find them dirty again. This can occur for many reasons but the friction and static charge is the most common. When you approach your windows with basic cleaners and materials, the friction that comes from wiping away dirt, dust and other debris creates a static charge. This static attracts airborne particles which leave your windows looking dirty in the blink of an eye. Naturally occurring dirt and debris can leave marks on your windows, as well as unnatural ones such as bird droppings. Only regularly scheduled maintenance can properly prevent these materials from having a negative impact on your space. Proper maintenance of your windows does not stop at the glass alone. Cleaning sills and frames can prolong the lifespan of your windows, saving you cash and stress in the long run.All of our Gorillas are local to your area, so we understand wanting to keep the purse strings tight while keeping your windows clean and that is what our Vaughan window cleaning does. 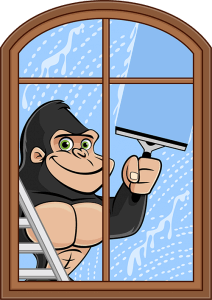 Instead of diving into window cleaning in the same way that you would wipe down a table or dust off a bookshelf, our Gorillas treat your windows right. Whenever your windows are in reach, rubber tools are used to clean glass panes while a bit of elbow grease cleans sills and frames. For those windows that are out of reach, our Gorillas come equipped with a mobile water source and water-fed poles. With the ability to reach up to four storeys, our Gorillas can handle your home and your workspace.